Do not despair if you have not managed to hit the slopes yet this year, you have not missed your chance… in fact the best is yet to come! There are plenty of resorts still open and will remain so even as as late as May! So if you’re looking for some late season adrenaline fuelled ski action here’s why spring skiing is going to be the best thing you do this season. So you have probably realised by now Easter is early this year, but not to fear. As if this wasn’t a good enough excuse to book a spring skiing holiday then we have some more tricks up our sleeves to entice you to the mountains this March and April. Don’t be tempted to flock to warmer climates for your Easter/ spring holidays when at many resorts the snow is waiting for you in its sunday best! Whether it’s a long weekend or a week long ski trip you’re after there are many reasons to visit the Alps this spring. With the resorts still donning more snow than you could shake a stick at, without the soul destroying crowds of the February holidays later in the season you can also benefit from the added bonus of spring ski deals. Late season is low season, so fantastic offers are rife and extend to flights, trains, transfers, accommodation, lift passes, lessons and other activities on and off the slopes. There are bargain to be had to suit all tastes and budgets, especially for families and larger groups. With the rising costs of family ski holidays spring skiing provide the best value, snowsure weeks of the season. If it’s impossible or impractical to get a whole week clear in the calendar there are some great long weekend ski deals around and with so many resorts being less than 90 minutes transfer away from Geneva Airport (such as Chamonix, Courmayeur, Megeve, Morzine, Flaine and La Clusaz just to mention a few) you will not waste precious ski and socialising time commuting. For some reasons there always seems to be an underlying worry about snow conditions (or lack thereof) at the extremities of the season. Unlike the potentially unreliable snow conditions at the beginning of the season, the end of the season in resorts such as Chamonix, Flaine, Tignes and Val Thorens are usually snowsure into early May! Skiing and snowboarding in late season means fewer people on the slopes, and less chance of lift queues which is also an added bonus. Spring skiing in Chamonix offers great conditions and boasts some of the highest accessible ski terrain in Europe, 90% of its piste (and off-piste) terrain above 1800m, usually open until early May. Lift access as high as 3840m via the Aiguille du Midi for off-piste adventures and 3300m on those that prefer piste skiing via Grands Montets means you are more than high enough to get some of the fluffy white stuff. Chamonix has both north and south slope aspects so you are always able to find great snow conditions all day long. Book or get a Quick Quote for your Airport Transfers to Chamonix here with Peak Transfer. Val Thorens biggest boast of Europe’s highest ski resort with its ski area predominantly above 2000m means that it is a spring skiing hot spot….or should we say cold spot? It’s aspect and altitude creates a spring skiing paradise open until early May. Part of the Three Valleys ski domain is a fantastic destination for any very late season skiing. It’s also been voted France’s Best Ski Resort at the World Ski Awards. Book or get a Quick Quote for your Airport Transfers to Val Thorens here with Peak Transfer. Tignes is another high altitude favorite known for its bargain ski holidays all year round. Although perhaps not the prettiest resort in the Alps it is very functional for those that just want a good value snowsure ski holiday. On the Tignes glacier there is skiing opportunities even in the summer. But as far as the official resort winter/spring season opening times the lifts are running until early May. Book or get a Quick Quote for your Airport Transfers to Tignes here with Peak Transfer. 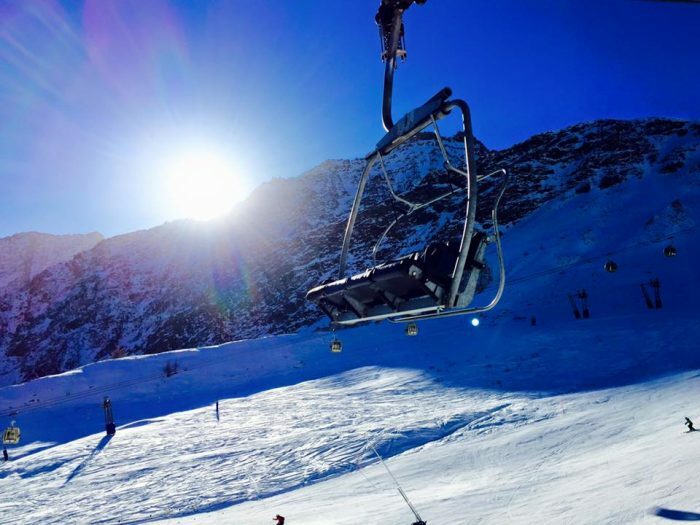 Sunshine, blue skies and great snow….. generally speaking! Embrace the sunny powder, t-shirt donning skiing or snowboarding in your favorite sunnies! There is nothing quite like skiing in the beautiful bluebird weather in the Alps. Other than eating alfresco at altitude with a thirst quenching tipple of choice on one of the many decked sun terraces with a post card picture view scattered over the Alps. For those rather more enthusiastic skiers that wake at the crack of dawn to get the first lift, you’re in luck as with longer daylight hours come spring allows for earlier and later lift openings. What’s more, the end of season brings many high profile events across the alps to keep you entertained with some great activities for families, and credible live music for party-goers. If not enjoy the well earned afternoon BBQ and beverage opportunities basking on the sun terraces of the apres ski bars when you finish for the day. So there you have it it’s cheaper, it’s quieter and its sunnier to ski or snowboard this spring, so what are you waiting for? Head for the high altitude resorts like Chamonix this Spring to find the fresh powder and glorious sunshine and you will in no doubt have the fantastic snow holiday you have been waiting all year for.